St. Panteleimon had studied medicine, but it was by the miraculous powers of Christ that he healed many people whom the doctors had not been able to help. He was martyred in 304 after the jealous doctors denounced him as a Christian. We remembered him with hymns in church today, the same morning that the gospel passage recounted Christ’s healing of the Gadarene maniacs. In both cases the earthly powers did not rejoice that the sick had been made whole, or that God was present and active in their midst. Their spiritual eyes were so clouded over that they completely missed the blessing. Lord, have mercy! 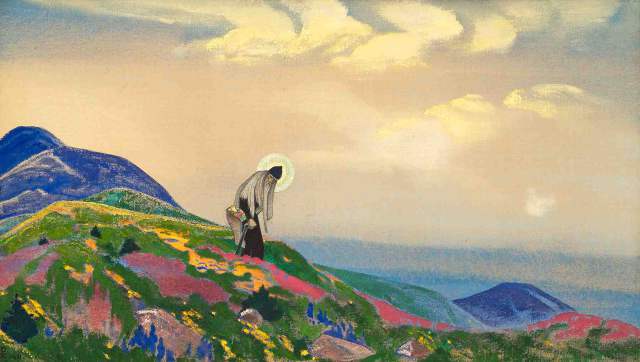 I love this painting of St. Panteleimon that Leah posted last week. I was thrilled twice this past week, when I heard first-person accounts of people who had been positively diagnosed with cancer, given a grim prognosis, and when tested thoroughly by the doctors just a bit later, no cancer could be found at all. How exciting! In both cases, much prayer by believers had occurred. I do think we see miraculous healings still, and I wish Christians talked about this more — it would be such an encouragement to all! As someone with a soon-to-be nurse in the family on one hand and a niece who's a miracle cancer survivor on the other, seems the medical community sees more than they're comfortable admitting among a skeptical public that has less occasion for contact. How they characterize what they see may vary widely however. Love Leah's artwork postings! Thanks for the repeat. The hermitage where my family attends services has a relic of Saint Panteleimon. I was not familiar with this saint until recently. What a treasure. This painting is beautiful. As I am struggling with pain and illness in the last weeks of my pregnancy I have asked for His prayers many times. Christ is the true healer of man.